As a Diamond Bourse of Canada member, you are welcome to test stones using the equipment in our gemmological technology facility. 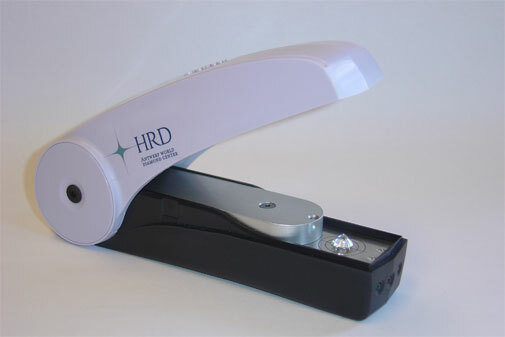 Two great and easy to use instruments for testing for Synthetics and Color Treatments are the DTC Diamond Sure™ and the HRD D-Screen. Operation is really simple: Turn the instrument on and watch it perform its self-check. 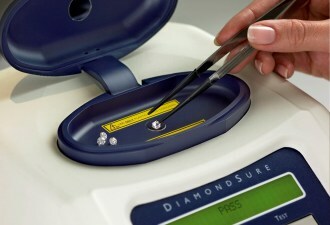 Then simply place a polished diamond over the sensor, close the cover, and in a few seconds the D-Screen gives its reading. This entry was posted in Diamond Grading, Grading, Synthetic Diamonds and tagged Color Treated Diamonds, D-Screen, Diamond, Diamond Sure™, DTC Diamond Sure, HRD, HRD D-Screen, Members, Synthetics by diamondbourse. Bookmark the permalink.